6-Fluoro-α-methyltryptamine (6-fluoro-AMT) is a tryptamine derivative related to compounds such as alpha-methyltryptamine and 5-MeO-AMT, which has been sold as a designer drug. Animal tests showed it to be somewhat less active than AMT or 5-fluoro-AMT, but it was nevertheless allegedly manufactured and sold from the laboratory operated by Leonard Pickard and Gordon Todd Skinner, who described 6-fluoro-AMT as "a beast". In interviews, Skinner stated that he first began to experiment with 6-fluoro-AMT in the early 1980s by giving it to high school friends. Their experienced made him cautious about the appropriate dosage amounts, which he says ranges from 25mg to 75mg [Skinner weighed about 250lbs at the time of his own bioassay]. 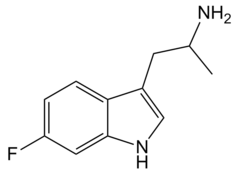 Skinner said that it is a long-lasting psychedelic with significantly more time distortion, and felt the drug was enhanced by combining it with ALD-52. ^ Kalir, A.; Szara, S. (1963). "Synthesis and Pharmacological Activity of Fluorinated Tryptamine Derivatives". Journal of Medicinal Chemistry. 6 (6): 716–719. doi:10.1021/jm00342a019. ^ "Unusual Analogues". thislandpress.com. This Land Press. Retrieved 8 April 2016. This page was last edited on 14 April 2018, at 01:40 (UTC).